submissions are not being emailed to me. They used to be. Then I changed the title of the form (only I see this) and now I no longer get emails. If I submit a form from my computer as a Test, I get a email. How do I ensure I get emails when I get submissions. I have tested your form (and reversed the submission count) and a clone of your form. On my end, I was not able to reproduce the issue. I have checked the mail-logs to make sure that your e-mail address was not on our bounce list (happens when e-mails are rejected) and I did not find it there. My suggestion would be to check your spam folders to see if the missing notifications are there. Also, please whitelist our Jotmails ip addresses or ask your email service provider to do it for you. 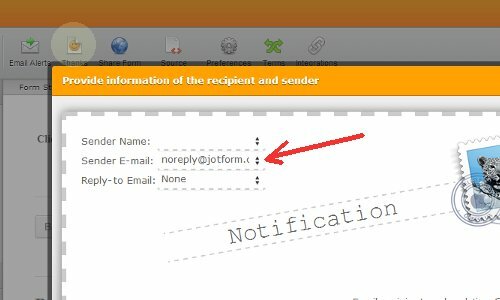 Another good suggestion would be to set the sender address tonoreply@jotform.com on your form notifications. Let me know if you have received my test submission by e-mail and do give us any other information that may help us further troubleshoot (ie. date and time of the submission with missing notification). are not there. I will follow through with your other suggestions. I did get the email you sent, I think - it says test and the jpeg attached was code of some sort - sent at 11:01pm last night. ok, I have whitlisted all 8 ip addresses. I have just checked your form and I did not see a notification, just an autoresponder, which is something different. You should create an email alert called Email Notification if you want to recieve submissions into your email. The autoresponder is inttended to be sent to those who have filled the form out. If you don't want to use our email address noreply@jotform.com,as the sender email, this is when you need to whitelist our IP addresses. Otherwise it is not necesary. Yes, you can have both, just add another email alert and choose the other one. Sorry for the inconvenience that may have caused. Mail log shows that it was successfully sent. Can you please try whitelist JotMail's IP's Addresses? Hi there, unfortunatey we did not receive the screenshot. If you would like to include it, please use our image button on the top right. We'll be glad to continue looking into the issue for you! Can you please try re-starting your browser and trying the image icon once again? Meanwhile, I will try a test e-mail to see if it works. I have cloned your form and tried creating a notification. The notification was delivered successfuly to my account . Please check your e-mail address and let us know if it was successfuly delivered. It seems that the issue is in your end as all seems to be in order on our side. Please continue to check the settings / filters on your end and let us know if there is any way we can contribute. PS. I have sent another test using the same clone. I have received the e-mail notification without any delay. If you have as well, feel free to clone the clone if you wish to use it in stead of your original form. Simply edit the notification and autoresponder as you wish.